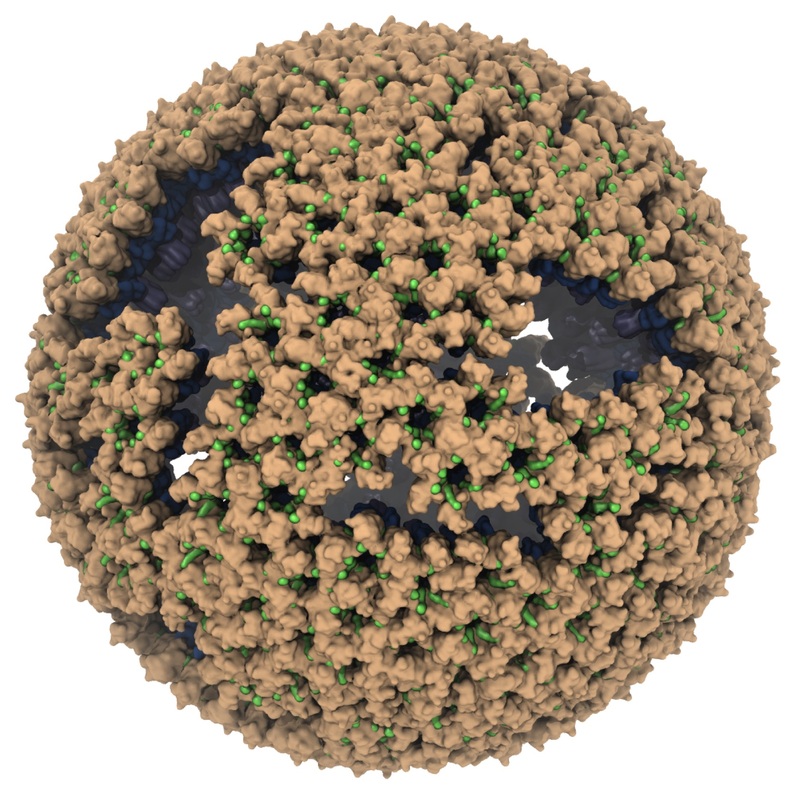 Immature modeling of an immature retrovirus – Boon Chong Goh, Ph.D.
After a retrovirus is assembled and budded off from the infected host cell, the virus is in its immature form where the viral proteins are arranged in a roughly spherical capsid. These viral proteins, also known as Gag polyproteins, contain the matrix (MA), capsid (CA) and nucleocapsid (NC) proteins. Upon maturation by proteolytic cleavage of Gag, immature retroviruses turn into infectious, mature virions. For RSV and HIV, one of the early cleavage events involves space peptide (SP), situated in between CA and NC. There is currently no high resolution structure of SP in its assembled state. Therefore, obtaining an atomic model of immature retroviral lattice that includes the SP domain will provide valuable structural insight. An all-atom model of an immature RSV lattice was constructed based on a subnanometer resolution structure of Mason-Pfizer monkey virus (M-PMV) previously obtained via cryo-electron microscopy (cryo-EM). Additional Gag components, namely p10 and SP-NC, were incorporated into the immature lattice model, without which the immature lattice would be unstable. SP-NC was modeled as a six-helix bundle and was simulated for almost 10 µs of replica exchange molecular dynamics simulations. The resulting model of the RSV Gag lattice shows features and dynamics of the capsid protein with implications for the maturation process. SP is a drug target of great interest because inhibiting the cleavage of SP-NC would severely jeopardize the maturation process of the virus. Preclinical drugs like Bevirimat (BVM) target the SP domain to inhibit the SP-NC cleavage, however they did not pass the clinical trial. Having characterized the structure and the dynamics of an assembled SP would hopefully shed light to the development of next-generation of maturation inhibitors.